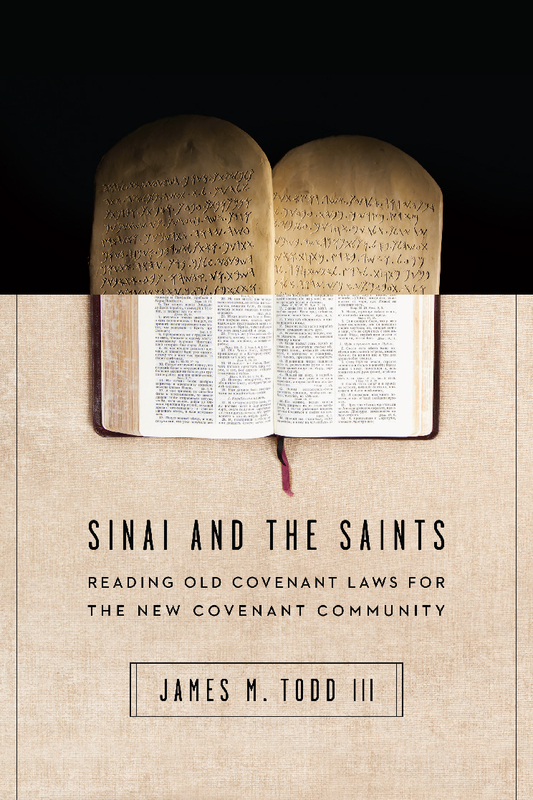 Todd III, James M. Sinai and the Saints: Reading Old Covenant Laws for the New Covenant Community. IVP: Downers Grove, IL, 2017. The relationship between the Old and New Testaments, and specifically the Mosaic covenant and the New Covenant, remains a perennial question in biblical and theological studies. James Todd has written Sinai and the Saints to bring clarity to this question. While he successfully describes the positions in the debate, his own position fails to convince. Todd writes Sinai and the Saints because it is difficult to understand the Bible without understanding how the laws fit in (p. 8). He limits his discussion to the laws of Sinai (pp. 21–22). He notes that law and covenant exist together both in the Bible and in the surrounding culture (p. 15). 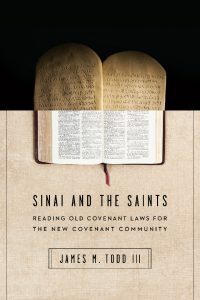 After setting the stage, Todd reviews the different approaches to the relationship between the laws of Sinai and the New Covenant, acknowledging that there is much common ground between the positions (p. 31). He lists three different positions: 1) moral law Christians affirm the authority of some Old Covenant laws, 2) Ten Commandments Christians affirm the continuing validity of the Ten Commandments, and 3) No-Old-Law Christians deny any continuing validity of the Old Covenant laws. He describes his method as follows (pp. 42–44): he is a “No-Old-Law” Christian, with some nuances; i.e. the Old Covenant was a temporary, conditional covenant, while the New Covenant ended the Old Covenant and therefore the members of the New Covenant are under the law of Christ. However, the Hebrew Bible is Christian Scripture and the Old Covenant laws are a positive good. He seeks to interpret the laws according to authorial intent, which he claims we discover by examining the clues left in the text (p. 47). Todd proceeds to set the Mosaic covenant in the context of the broader storyline of the Pentateuch, arguing that this broader context helps explain the nature of the Sinai Covenant (Chapters 3–5). Todd spends the next two chapters discussing the Ten Commandments and the Law of Christ. Todd argues that the Ten Commandments are no longer binding on Christians. He attempts to answer the charge of antinomianism by explaining how believers are under the law of Christ (p. 109), which he defines as the law of love (p. 110). He explains that natural law accounts for the ethical overlap between the Mosaic covenant and the New Covenant (pp. 112ff). Should Christians be concerned to know the Mosaic covenant? Todd answers yes. The Mosaic covenant reveals God’s righteousness in space and time (p. 128). The sacrificial elements of the Mosaic covenant, such as the tabernacle and the sacrificial system, point ahead to the work of Christ (pp. 129–139). He points out a link between wisdom and law, arguing that knowledge of the specific Old Covenant laws provides a sense of God’s moral order (p. 143). Additionally, the whole law finds its fulfillment in the gospel. Sinai and the Saints is a helpful book because Todd overviews some of the central problems which surround discussions of the Mosaic law. While summarizing these problems, Todd emphasizes the amount of common ground that adherents of the different positions have. This concession is important since discussions of the Mosaic law are often fraught with tension. Todd follows the standard New Covenant Theology line of argumentation. The critiques that have been leveled at that system over the past several years apply to Todd’s work as well. A few of these critiques are worth noting, especially since Todd communicates his position so clearly. First, Todd criticizes the standard moral, civil, and ceremonial distinction commonly held by proponents of covenant theology. He charges proponents with picking and choosing which laws apply and which ones do not (p. 36). He also argues that the moral, civil, and ceremonial terms do not appear in Scripture. These criticisms seem compelling at first glance. On further examination, however, they fall short. The tripartite distinction does not necessarily lead to “picking and choosing” which laws to apply, especially when certain laws in the “moral” category predate the Mosaic covenant (pp. 14, 143). Moral law Christians may be identifying a concept within the text and applying an extra-biblical label to it. Todd rejects the tripartite distinction because it is an extra-biblical category without explicit textual warrant. However, Christian theology and hermeneutics often lack an explicit reference. For example, the doctrine of the Trinity consists almost entirely of inferences drawn from the biblical data. Additionally, it is commonplace for modern interpreters to see Genesis 3:15 as a reference to Christ, although Scripture never uses this verse in reference to Christ (my thanks to William R. Smith for this observation). Lack of explicit reference is insufficient grounds for rejecting the tripartite division position. Second, the Sabbath command is a major touchstone for the critique of the Mosaic law’s applicability (pp. 95–103). This critique is a common trope of New Covenant Theology literature. This critique assumes the Sabbatarian position of the Westminster Confession and Catechisms (and the 1689 London Baptist confession which is based on Westminster). One immediate problem with this critique is that it assumes that many who hold to a moral law view or a Ten Commandments view of the law also subscribe to the Westminster position. A cursory reading of Reformed confessions and exegetes would demonstrate that the Westminster position is not the consensus position. Since the Ten Commandments only position does not rest on the Westminster interpretation of the Sabbath commandment, Todd’s argument falls short. Third, Todd spent several chapters retelling the narrative around the events at Sinai. His description was accurate, but it was unclear how his retelling advanced his argument. It appears that he wanted to show how Israel’s interaction with the Mosaic law was negative. However, it is not clear how retelling Israel’s story informs this discussion. Todd’s argument works well if he is arguing against those who believe the law justifies, but I do not know of any Christian—evangelical, Catholic, or Orthodox—explicitly making such an argument. Finally, Todd’s language about the law’s discontinuity runs into problems of theology proper. He makes a strong contrast between the law of Moses and the law of Christ, failing to mention that the law of Moses was written by the finger of God (p. 109). This contrast places discontinuity between God the Father and God the Son, not the Mosaic and New covenants. Sinai and the Saints clearly summarizes different positions on the Old Testament law. It is a clear representative of New Covenant Theology. However, this book’s argument is not convincing. The book contains problems that mar Todd’s position. It may be valuable for those who want to understand New Covenant Theology better, but it will likely be persuasive only for those who already subscribe to Todd’s basic premises.